Voicing "the highest level of concern," State Department spokeswoman Heather Nauert said the unsafe intercept of a Navy EP-3 aircraft on Monday violated a 1972 U.S.-Russia agreement. "The United States notes with the highest level of concern the latest incident of unsafe Russian military practices over the Black Sea on Jan. 29," Nauert said in a statement. A video clip of the incident was posted on the Navy Forces Europe website. "While the U.S. aircraft was operating under international law, the Russian side was flagrantly violating existing agreements and international law, in this case the 1972 Agreement for the Prevention of Incidents On and Over the High Seas (INCSEA)," she said. The statement signals a shift in Trump administration policy toward Russian attempts at aerial coercion. Nauert used unusually harsh diplomatic language in criticizing the Russian military action, and it was the first time such terms have been used for many years. Following past incidents of several dangerous Russian aerial intercepts of U.S. aircraft no similar accusations of treaty breaches were made. Official U.S. statements after the aggressive Russian aircraft intercepts have been limited to expressions of concern and claims the incidents are being further investigated. The dangerous intercept is "the latest example of Russian military activities disregarding international norms and agreements," Nauert stated. "We call on Russia to cease these unsafe actions that increase the risk of miscalculation, danger to aircrew on both sides, and midair collisions." In Moscow, the Defense Ministry denied the Su-27 pilot acted provocatively. "The entire flight of the Su-27 was conducted in accordance with international regulations, and there were no emergency situations," the ministry said in a statement, according to state-run RT. The Russians claimed the jet was scrambled in response to a flying object detected heading for the Russian border. Moscow asserted the EP-3 was intercepted "at a safe distance" and followed until it changed course away from Russian airspace. 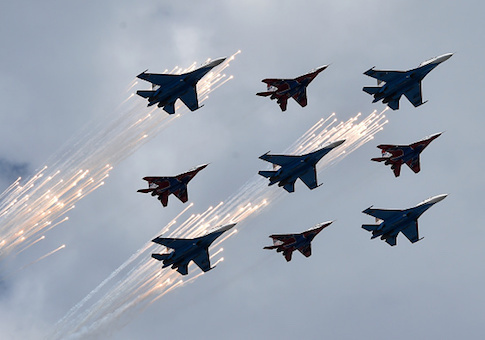 The Su-27 intercept is the latest military provocation by the Russian military in the region. Earlier on Sept. 7, 2017, a similar dangerous intercept took place between and Su-27 and a P-8 over the Black Sea. That incident ended after 19 minutes and the Su-27 flew as close as 10 feet. In February, four Russian warplanes conducted low passes over the USS Porter, a guided missile destroyer in the Black Sea during a NATO military exercise in the region. Last May, a Su-27 flew within 20 feet of a P-8 surveillance jet over the Black Sea in an encounter deemed safe by the Navy. 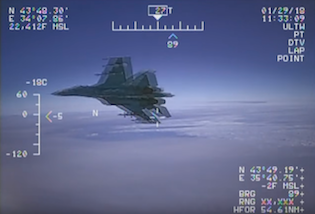 The latest aerial encounter highlights growing U.S.-Russia tensions in the region. The Trump administration is demanding Moscow give up control over the Crimean peninsula as a precondition for improved ties. Crimea was taken over by Russian troops in early 2014 and later annexed, forcing Ukraine to lose many valuable industrial plants located in the region. The invasion, which came under the direction of Russian dictator Vladimir Putin, overturned most of the assumptions of the post-Cold War order in Europe. As a result of the takeover, U.S. and NATO allies have been conducting warship operations in the Black Sea as well as aerial surveillance flights to track Russian military activity. Russia has been supporting covert paramilitary operations in Ukraine in a bid to destabilize the government. The EP-3 incident was disclosed by U.S. Naval Forces-Europe in a statement that said the EP-3 was flying in international airspace at the time of the intercept. "This interaction was determined to be unsafe due to the Su-27 closing to within five feet and crossing directly through the EP-3's flight path, causing the EP-3 to fly through the Su-27's jet wash," the Navy said. "The duration of the intercept lasted two hours and 40 minutes." The Navy said Russia's military has a right to operate in international airspace "but they must behave within international standards set to ensure safety and prevent incidents" including the 1972 agreement. "Unsafe actions‎ increase the risk of miscalculation and midair collisions," the statement said. "The U.S. aircraft was operating in accordance with international law and did not provoke this Russian activity." Russia is also in violation of the 1987 Intermediate-range Nuclear Forces treaty by deploying a new ground-launched cruise missile banned under that accord. The Pentagon is considering development of new intermediate-range missiles in response. This entry was posted in National Security and tagged Military, Navy, Russia, State Department, Vladimir Putin. Bookmark the permalink.